BC8360 is a two-part polyurethane molding system. BC8360 is mixed one-to-one by volume (or 100A-to-95B by weight) and cures at room temperature. BC8360 contains no fillers and cures to a firm (Shore A60 4), medium amber rubber. BC8360 is used to make molds of detailed masters that contain shallow undercuts. Some of the most common uses are molds for point-of-purchase displays, rapid prototypes, special effects, taxidermy, and sculpture reproductions. BC8340 is a two-part polyurethane molding system. BC8340 is mixed one-to-one by volume (or 100 Iso Side A to 95 Curative Side B by weight) and cures at room temperature. BC8340 contains no fillers and cures to a firm (Shore A40 4), medium amber rubber. BC8340 is used to make molds of detailed masters that contain moderate undercuts. Some of the most common uses are molds for point-of-purchase displays, rapid prototypes, special effects, taxidermy, and sculpture reproductions. BC 8201 when blended with BC ISO 25 will yield a 80 Shore A material ideal for concrete stamp pads. These pads can be designed to replicate almost any brick, stone, slate or other pattern. BC909 is a two-component system consisting of Iso (side A) and Curative (side B). It is designed to be used where curing at ambient temperatures and high level of mechanical properties of cured material is desired. BC 709 is a two-component system consisting of Iso (side A) and Curative (side B). It is designed to be used where curing at ambient temperatures and high level of mechanical properties of cured material is desired. BC 1000 is blended silicone based release agent that exhibits good release characteristics in both elevated and room temperature urethane, and epoxy molding applications. BC 8104 is a 4 LB/FT3 two-component urethane rigid foam designed for general purpose molding and casting of various shapes. This product is a safe, easy-to-handle, room temperature mixing and curing system. BC5500 is a very low viscosity yet tough system for the production of composite parts and tools using an infusion process such as Vacuum Assisted resin Transfer Molding, RTM or other infusion processes. Flex-Kast Clear is a two-component water clear UV resistant urethane elastomer compound designed for general purpose molding and casting of various shapes where optimum clarity is desired. This product is easy-to-handle, room temperature mixing and curing system that contains no TDI, MDA or MOCA. Flex-Kast Clear may also be used in potting and encapsulating applications. Color and CTE matched adhesive for high temperature epoxy tooling board. bonding and patching EB 6200 Blue High Temperature Epoxy Tooling Board. BC8321 is used to make soft molds of detailed masters that contain deep undercuts. Some of the most common uses are concrete formliners and to make molds for point-of-purchase displays, rapid prototypes, special effects, taxidermy, and sculpture reproductions.BC8321 Softener Part C can be used to reduce the hardness below 10A. BCC Products, Inc./Blehm Plastics announces our newly developed tooling board for the composites industries: EB6200, a high-temperature epoxy tooling board. BCC and Blehm have been leaders in innovative performance products for over 60 years, and the EB6200 is no exception. Built to the exacting standards of all BCC/Blehm products, the new EB6200 high-temperature tooling board is ideal for those using prepreg in the construction of tools for composite parts. After extensive testing, the EB6200 board has shown few effects even at a temperature of 300°F. The EB6200, available in 2, 4, and 6 inch x 24” x 60” has been developed to meet the needs of those in the aerospace, motorsport, and automotive industries. The material has excellent aspect and cutting performance; shaving it creates only a little dust, which saves on cutting tools and post-cutting cleanup. With a shore hardness of 65D and a density of 39lb/ft3, the EB6200 is becoming the favorite among epoxy board users. BC8782 produces a high-impact, rigid, 82 Shore D material that is commonly used to make clear or tinted castings of all kinds. When used at room temperature, material 1/8″ thick or thicker can be readily cast. Castings that are less than 1/8″ thick generally require a mild post-cure. BC8782 is easily tintable using BCC color tints. This system is not recommended for use with tin-cure silicone. DP-11-83 is a low-viscosity, quick-setting, easy-to-use adhesive and/or casting material. This product was designed to bond together our MB1200 foam board to create desired dimensions in length, width, and height. DP-11-83 has a working life of up to 13 minutes for casting applications; if used as an adhesive, it is workable for up to 16 minutes. The VR-5 pumps directly out of five-gallon open-head shipping containers. Dual cylinder rams ensure positive material feed. A hand gun with snuff back ensures accurate, clean, adhesive placement; simple durable piston pumps ensure long life and easy maintenance. The Ram Flow is a constant flow, two-part metering system that is a simple, yet highly capable, machine for dispensing two-part, high-viscosity materials. Accurate to within 1%, the Ram Flow eliminates weighing/mixing errors. Output is adjustable to more than one gallon per minute, with a convenient solvent flush system. It delivers a constant flow of accurately metered material though a static mix head with a slide ratio adjustment from 3.5:100 to 15:100. It pumps directly from a 55-gallon drum, and a spray gun is available for spray mold making. The Perfect Flow is a constant flow, two-part metering system for high volume production; it’s tough enough to run for multiple shifts! For urethane molding and casting, the Perfect Flow quickly fills large molds, with accurate metering, dual action, pumps for constant flow. For resin infusion, it fills large molds or parts without the panic. It’s adjustable from a very slow gentle output up to 27 lbs. per minute. Perfect Flow is the right machine for dispensing: urethane, epoxy, silicone, acrylic, PVA, and urea-formaldehyde. As shown, the Pro Meter comes with standard 9 ft. hoses, gun, and 5 gallon reservoirs. A simple, yet highly capable, dispensing machine, the Pro Meter delivers accurately metered material through a static mixer. The output is adjustable from slow and gentle up to 1 gallon per minute! An easy slide ratio adjustment is available from 6:100 to 1:1, and the Pro Meter will dispense out of 55-gallon drums, pressure pots, or 6-gallon cans. The base machine is, of course, ready to do most jobs; however, we can discuss many other options to meet your needs. Super E, shown here with urethane options, is an air-powered, low-cost, two-part meter mix system for epoxies, urethanes, and silicones. A break-through in reducing both capital and operating costs, the Super E is a simple, durable meter mix machine that will handle any self-leveling material. Its piston-type pumps with hard parts give it long life and resistance to abrasives. Choose either continuous pulsing flow of 3–4 pounds per minute or a 5 to 50 cc single shot with an adjustable stop. Available in ratios from 1:1 to 16:1, with the ratio adjustable over a smaller range. For use with urethanes, at no extra cost we offer optional hoses, ISO oilers, and desiccant tubes on the reservoirs. The Goo-Grinder uses gear pumps and a chain drive to accurately meter two-part materials, with a ratio range of 1:1 to 6:1. The fixed ratio is easily adjusted by changing drive sprockets. One, two, or five-gallon reservoirs are available, along with drum feed. Output is up to1.5 quarts per minute (less with more viscous materials). With optional heater, the Goo-Grinder is used for non-abrasive materials with viscosities from 300 to 50,000 cps or more. The Model “B” delivers four times the output per stroke of the model A. Accurately dispenses up to 2 quarts of unmixed 2-part resin per minute. Mixer manifolds, heaters, and other custom options are available. Handles material viscosities to 7000 centipoise (cps) or more with optional heater. The dispenser accurately dispenses up to 1 quart of unmixed two-part resin per minute and is available in ratios from 100:1 to 100:100. Mixer manifolds, heaters, and other custom options are available. With the optional heater, the dispenser handles material viscosities to 7,000 centipoise (cps) or more. DP-11-88 is a medium-viscosity, quick-setting, easy-to-use urethane adhesive. This system was specifically designed to bond together the MB2001 Model/Tooling Board to create desired dimensions in length, width, and height. DP-11-88 offers a working life of 10–12 minutes in 1/4 pound mass, and 20 + minutes in a 1/16 inch film. 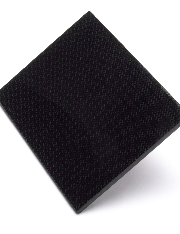 DP-11-75 is a two-component, medium-viscosity urethane patch system. A hybrid product, it was designed specifically for making quick responsive repairs/buildups to the MB4000 Foundry Plank. DP-11-75 is exceptionally tough, highly machinable after cure, and exhibits similar superior properties as the MB4000. BCC Products, Inc./Blehm Plastics is proud to announce we’ve added the specialty chemistry of cyanoacrylate adhesives to our quality product line. The BC100 family of cyanoacrylates offers fast cure speeds formulated to bond those hard-to-bond surfaces with dependable strength. The BC100 adhesive comes in three formulas: BC100 Thin, BC100 Medium, and BC100 Thick. All three formulas perform to the exacting standards for which all BCC Products are known. All our cyanoacrylate adhesives currently come in 1oz and 2oz bottles, with other sizes available upon request. The BC100 cyanoacrylate adhesive family also has a De-Bonding agent which will remove the bonds of all three versions of our adhesive (thin, medium, and thick). 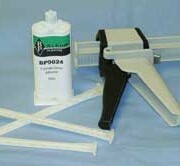 The BC100 family also has an Accelerator for quickening the bond when sprayed. With our complete line of cyanoacrylate adhesives and ancillaries, you can’t go wrong with BC100 product family from BCC Products, Inc/Blehm Plastics. 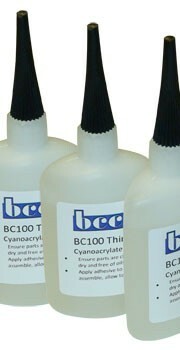 BC100 Thick is the slow and thickest member of our line of cyanoacrylate adhesives. Excellent for filling gaps, the BC100 Thick has a 30-second fixture time for the material to fill voids and bonding areas. Although formulated especially to bond with plastics, metals, and elastomers, it bonds well to a variety of substrates and materials. It’s perfect for bonding rough and irregular surfaces and for applications requiring up to 15 seconds of alignment and work time. BC100 Medium, like its name indicates, is the medium-viscosity version of cyanoacrylate adhesive that has become the most popular in super-bonding applications. A 12-second fixture bond makes the BC100 the fastest in our family of cyanoacrylates. 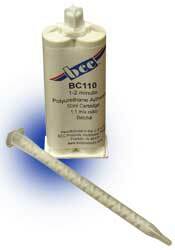 Excellent for bonding rough and porous surfaces, BC100 meets military specifications (MLLA 46050 Type II Class II). It’s perfect for industrial manufacturing and repair applications, because it allow you to bond with speed. BC100 Thin is a low-viscosity material ideal for bonding larger areas. It has a 20-second fixture cure and is able to fill gaps of .002″ wide. BC100 Thin is perfectly designed for bonding plastic parts and other substrates like stainless steel, neoprene and ABS (acrylonitrile butadiene styrene), and even nitrile rubber. BC87 urethane parting/yellow is an excellent low-viscosity, easy-to-use release agent for two-component polyurethane systems. Using BC87, rigid, semi-rigid, and flexible parts easily release from molds, and fine surface detail is achieved. BC84 PVA parting/green is a water/alcohol solution of water-soluble, film-forming materials. It is particularly recommended as a parting layer for separation between polyester or epoxy resins and various mold surfaces. BC84 is normally applied by spraying it on the mold surface, and it dries at room temperature to form a smooth, very glossy film that will not shrink or pull away from corners or curved surfaces. After drying of the resin, the film parts easily from the mold and water readily dissolves it from the molded parts. BC5009 is a very low viscosity, modified, unfilled room-temperature curing epoxy system with high-performance capabilities. Built for companies needing a 30-minute pot-life and an easily applied adhesive for bonding items like tooling/modeling boards and mid-to-large epoxy parts, as well as in other typical bonding environments, the BC5009 epoxy system will perform to your expectations. BC5009 is easy to mix, easy to apply by brush or trowel, and has excellent adhesion to most tooling materials and applications. Although this clear-amber epoxy adhesive is especially formulated for the bonding of wood and urethane model board, it may also be used as a laminating resin. The BC50009 system has the added advantage of being a color-indicated system that visually shows the mix ratio. When mixed to the proper ratio, the green hardener and amber resin cure to light translucent amber, promoting fast and efficient mixing, with no time wasted over-mixing. BC 9060 is a blue-colored, two-component, flowable compound that, regardless of thickness or confinement, cures at room temperature or by application of heat. The cured rubber is high strength and high tear with good elongation. BC9060 is a mold-making material recommended for repetitive production of intricate shapes cast in epoxy or urethane resins. It is also used in the potting of electronic components and in protecting sensitive assemblies against thermal shock and vibration. BC9040T is a clear, addition/platinum cure, two-component, flowable compound that, regardless of thickness or confinement, cures at room temperature or by application of heat. The cured rubber is high strength and high tear, with good elongation. BC9040T is a mold-making material recommended for repetitive production of intricate shapes cast in epoxy or urethane resins. It is also used in the potting of electronic components and in protecting sensitive assemblies against thermal shock and vibration. BC9020 is a violet colored, two-component, flowable compound that, regardless of thickness or confinement, cures at room temperature. The cured rubber is high strength and high tear, with good elongation. In addition, BC9020 features low viscosity, low durometer, and resistance to sulfur clays. 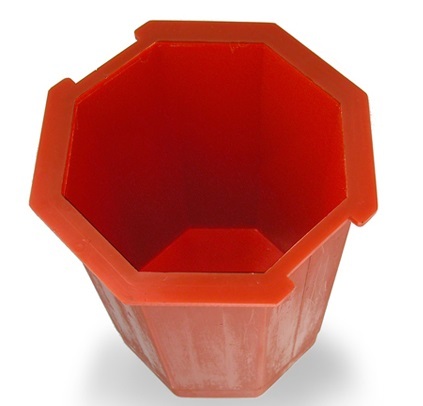 DP-11-90 is an unfilled, low-viscosity, quick-setting, two-component urethane system. An easy to use 1 to 1 mix ratio by volume and 110:100 by weight (Part A/Part B), DP-11-90 offers the user a three-minute working time with parts demoldable in as little as 30 minutes. When properly cured, DP-11-90 will exhibit high impact strength and yield thermoplastic-like parts. BC8405 is an unfilled, low-viscosity, quick-setting, two-component urethane system. Its easy-to-use 1 to 1 mix ratio (Part A/Part B) offers the user a good working time: parts may be demolded in as few as 2 hours. When properly cured, BC8405 will exhibit high impact strength and yield thermoplastic-like parts. BC8400 is an unfilled, low-viscosity, quick-setting, two-component urethane system. Its easy-to-use 1 to 1 mix ratio (Part A/Part B) offers the user a three-minute working time: parts may be demolded in as few as 30 minutes. When properly cured, BC8400 will exhibit high impact strength and yield thermoplastic-like parts. BC8165 is a low-viscosity, rapid-setting, rigid urethane compound; it has an 8–10 minute working time. This system will cure quickly to a hard, tough, impact-resistant casting. BC8165 is non-sensitive to moisture after cure and, if stage pours are required, it will readily bond to itself. BC8165 is recommended for thin-wall model and prototype applications where a “thermoplastic feel” is desired. The heat resistance of BC8165 is 135°F; however, a heat resistance of 150°F can be achieved by about 2 hours post cure at 150°F. BC8163 is a very low-viscosity, rapid-setting, rigid urethane compound. This system will cure quickly to a hard, tough, impact-resistant casting. BC8163 is non-sensitive to moisture after cure and, if stage pours are required, it will readily bond to itself. The one-to-one volume mix ratio makes the system readily adaptable for machine mixing and dispensing. 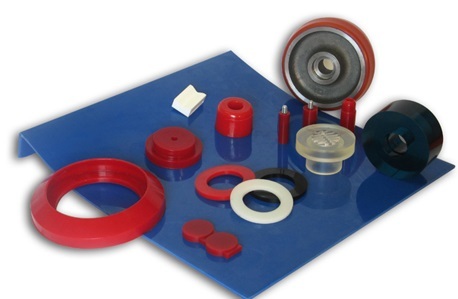 BC8163 is recommended for applications where a “thermoplastic feel” is desired. BC8160 prototyping resin is a impact- and abrasion-resistant polyurethane resin that can be used in all types of designs and models. BC8160 has excellent memory: when casted into shapes, it can return to those shapes with exacting results. BC8160 is the ideal choice for designers and prototypes that require a “living hinge” type of material. BC8086 is a rapid-setting, low-viscosity, polyurethane casting system. It has a working life of 45 seconds, and at 7–10 minutes it obtains a demoldable hardness. BC8655 is an advanced fast-cast polyurethane tooling system that features a working time several minutes longer than our BC 8650, low viscosity, low exotherm, and minimal shrinkage. Kwik-Kast Blue II cures hard, and more durable, resulting in less brittle parts. It is designed for constructing patterns, prototypes, duplications, negatives, low-temperature vacuum form tools, tracing models, etc. BC8009 Slo-Kast is a low-viscosity, medium-setting, easy-to-use casting material. When properly cured, this polyurethane system features extremely low shrinkage. Unlike Kwik-Kast, BC 8009 offers the user longer working time for filling large closed mold cavities. Slo-Kast is ideal for casting large sections without having to pour in stages. Its uses include tracing models, core boxes, keller aids, patterns, core sticks, vacuum form tools, prototypes, and display parts. BC8007 Lik-Wood is a low-viscosity, quick-setting, easy-to-use casting material. 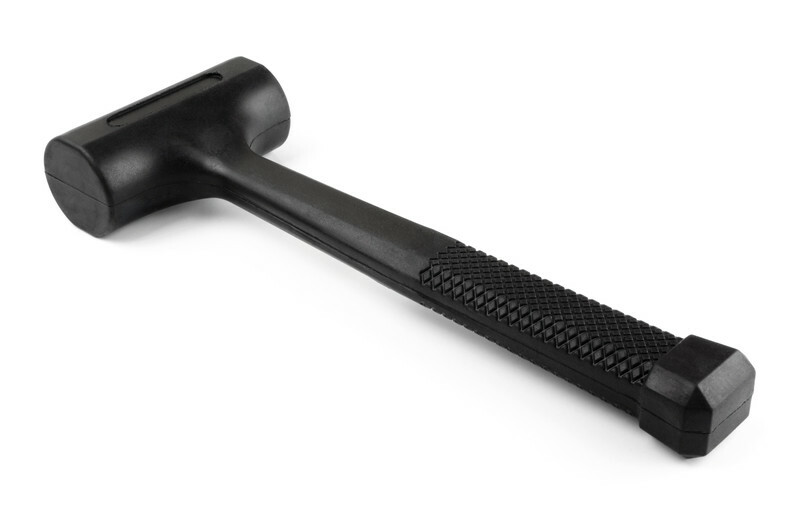 A model or tool cast from Lik-Wood will weigh 60% less than other filled urethane systems. Within 30 minutes after mixing and pouring, Lik-Wood is ready to be carved, sanded, filed, tapped etc. Its amazing wood-like characteristics make it ideal for lightweight backing of laminates and/or surface coats. It’s perfect for fast take offs, cores, engineering changes, temporary molds, patterns, models, prototype,s and bases for die models. BC7136-2H is a thick section casting system with heat resistance to 300°F. It may be cast to a thickness of 2 inches in non-conductive molds, 3 inches in conductive molds, and thicker sections with the addition of bulk fill. For use above 150°F, a post-cure is required. This product does not contain VCHD and MDA. BC7136 is a gray, low-toxicity, aluminum-filled, epoxy casting resin. This heat resistant system may be used at room temperature without post-curing and may be cast to a thickness of 3/4 inch in non-conductive molds. For use above 150°F, a post-cure is required. This product was engineered to replace VCHD and MDA systems while retaining excellent heat resistance and low viscosity. BC7009-1 is an iron-filled, low-cost mass casting system. Without foaming or yielding excessive shrinkage, this system can achieve thickness of up to two inches in non-conductive molds and four inches in conductive molds. It’s ideal for stretch forms, patterns, dies, molds, duplications, prototypes, etc. BC8880 is a two-part urethane gel coat that has excellent handling characteristics, very low moisture sensitivity, a high modulus, and a high hardness. It is a brushable room-temperature curing urethane that has many general purpose applications such as foundry patterns, cure box liners, and abrasion-resistant pads and bumpers. It may also be used as a urethane adhesive. 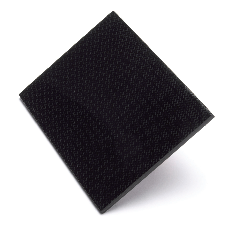 BC6128 is a black, non-staining, silicon-carbide filled, “die surface,” surfacing resin. This thixotropic resin system provides excellent surface duplication, along with good vertical coverage. It provides extended mold life due to superior wear resistance and hardness. This heat-resistant resin system may generally be used at room temperature without post-curing; however, for use above 150°F, a post-cure is required. BC6128 can be consistently used to 300°F. Does not contain VCHD or MDA. BC6126 is a gray, low-toxicity, aluminum-filled, epoxy surface coat that provides excellent surface duplication, along with vertical coverage to 1/16″ thickness. This thixotropic heat-resistant resin system may generally be used at room temperature without post-curing; however, for use above 150°F, a post-cure is required. BC6126 can be consistently used to 300°F. It was engineered to replace VCHD and MDA systems while retaining excellent heat resistance. BC6060 is a blue epoxy, abrasion-resistant, surfacing resin. Commonly referred to as “die surface” material, this system may be applied by brush or may be cast in thin sections to a maximum of 1/2″. Ideally suited for a variety of applications, BC6060 is recommended for dies; foundry pattern and core boxes; and router, trim, and inspection fixtures. BC6005 is a snow-white thixotropic epoxy resin designed specifically for quality reproduction of a variety of surfaces. A room-temperature cure system, BC6005 offers ample working time yet affords quick-tack for lamination. 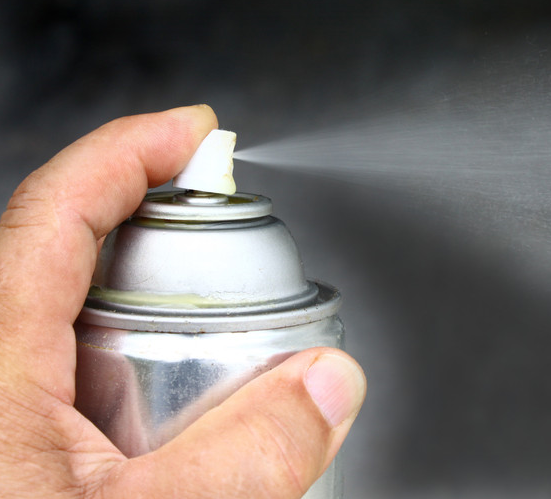 BC6005 may be applied easily with a brush or may be troweled to a thickness of 1/8″ or less on vertical surfaces or over sharp radii without sag or fear of run-off. When cured, this resin system provides a hard, tough, chip-resistant surface. BC6004 is a white thixotropic epoxy surface coat that has the ability to cure and bond to freshly poured wet plaster. This formulated resin compound can be applied with a brush or can be troweled to a thickness of 1/8″ or less on vertical surfaces or over sharp radii without sag or fear of run-off. 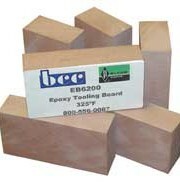 BC6004 features moderate heat resistance and tracing hardness. BC5114 is a gray, low-viscosity laminating system. This heat-resistant resin exhibits excellent “wet-out” and reasonable working time. Generally it may be used at room temperature without post-curing; however, for use above 150°F, a post-cure is required. BC5114 can be consistently used to 300°F . BC5105 is a clear, unfilled, low-viscosity laminating system. This heat-resistant resin exhibits excellent “wet-out” and reasonable working time. Generally it may be used at room temperature without post-curing; however, for use above 150°F, a post-cure may be required. BC5105 can be consistently used to 300°F . BC5010 is a high-quality, low-viscosity. room-temperature curing laminating resin that creates a safety system for the production of a variety of dimensionally stable fiberglass tools. BC5010 has a minimal odor and features rapid “wet-out” with no vertical drain off. It’s an excellent general-purpose laminating resin that meets the tooling requirements for automotive, aircraft, and foundry industries. The combined BCC/Blehm has been a leader in innovative performance products for over 80 years, and the EB6200 is no exception. Built to the exacting standards of all BCC/Blehm products, the new EB6200 high-temperature tooling board is ideal for those using prepreg in the construction of tools for composite parts. After extensive testing, the EB6200 board has shown few effects even at a temperature of 325°F. With a shore hardness of 70D and a density of 47lb/ft3, the EB6200 is becoming the favorite among epoxy board users. BCC Products, Inc./Blehm Plastics announces our newest prototyping resin. The BC8160 prototyping resin is an impact- and abrasion-resistant polyurethane resin that can be used in all types of designs and models. BC8160 has a high memory when casted into shapes and can return to those shapes with exacting results. BC8160 an ideal choice for designers and prototypes that require a “living hinge” type of material. BC8160 cures to a 62 shore D material with a flexural modulus in the 78,000 ranges; it is a light amber color that may be tinted using colorants made by BCC/Blehm.